I’m not too proud to beg for Pork Chops and eggs! April 18, 2015 ~ Trevis Dampier Sr. The pig dates back 40 million years to fossils which indicate that wild pig-like animals roamed forests and swamps in Europe and Asia. By 4900 B.C. pigs were domesticated in China, and were being raised in Europe by 1500 B.C. On the insistence of Queen Isabella, Christopher Columbus took eight pigs on his voyage to Cuba in 1493. But it is Hernando de Soto who could be dubbed “the father of the American pork industry.” He landed with America’s first 13 pigs at Tampa Bay, Florida in 1539. It’s Saturday and time to get out of bed nice and slow and eat something hardy to celebrate the NBA playoffs! One of my favorite meals that just never gets old is Pork Chops and Eggs! I’m sure you are doing jumping jacks right now hearing about this!!! Woohooo!!! 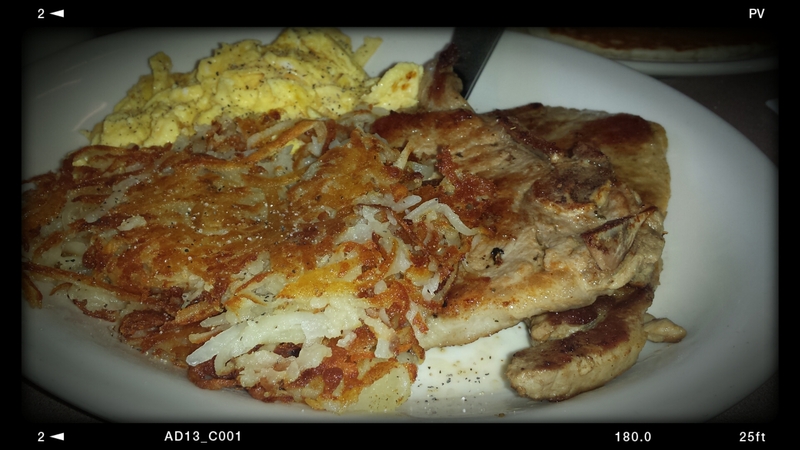 Something about pork in the morning with eggs, hashbrowns and orange juice just lights up my life! It is not heavy like a steak and not as light as eggs but just perfect for a breakfast meal that leaves you in a state of heavenly bliss. You can even add applesauce or some kind of sweet sauce to it and it will really make your day. At Mil’s Diner they do a great job with the seasoning and not overcooking the pork chop. It is tender and flavorful and having that luscious bite of the chop with the crunchy hash browns just makes this meal a breakfast of champions! Good job Mil’s! Now let’s talk about how I get down with the pork chops! I love my pork chops with a little sweetness added to it. I usually add honey on top but apple flavor would go great with this. I recommend you be a little creative and create an apple jelly of some kind and smother that on your pork chops or keep on the side as a dip. That would be true live action eating! Thanks for joining me on today’s adventure! I look forward to seeing you on the next run. See a recipe below for some spicy & sweet pork chops below. Grab a large plan and place ¼ cup of oil n pan and out on medium heat. Once oil is hot then crack eggs into a bowl and add 1/3 cup of chicken stock. Stir eggs in bowl and then add to pan. Scramble eggs.Remove from pan, sprinkle with salt and pepper and serve. < Previous Romance..Music..Mountain Colors of Green and Blue at The GrandView!! Next > I’ll do back flips for beer and chicken strips!